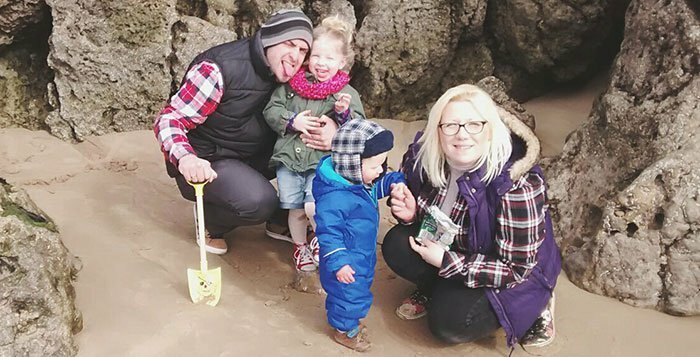 Cara Wright: "I’d battled cancer and lost my baby to cot death all on the same day." "I had no idea that I had been experiencing symptoms of ovarian cancer as they are often very similar to signs of pregnancy, making it even more difficult than usual to detect. I was 23. The tumour was growing quickly so the doctor suggested that we operate and remove it as soon as possible. My husband, who was serving in Afghanistan with the RAF, flew back to Scotland to be by my side. I underwent major surgery to remove the tumour, my right ovary and to take out some lymph nodes to check the cancer hadn't spread. It was a risky move for the pregnancy and, when I woke from my operation, a midwife arrived to check for a fetal heartbeat. Thankfully the baby was fine and the surgery had been a success. Or so we thought. A month later, following a check-up, I had a call from the doctor to inform me that some particles may have been left behind. At seven and a half months pregnant I was back at the hospital to have the baby delivered early so that I could start chemotherapy as soon as possible. My beautiful baby Olly was born weighing 3lbs, 15 oz. He was so tiny that he was immediately taken away to the neonatal unit and given a feeding tube and help with oxygen. It was hard watching him struggle, but gradually he got stronger and by the time he was three weeks old we were able to take him home. Once Olly was home, I went straight into hospital to start chemotherapy. It seemed a doddle at first but after a month I was tired, I lost my hair and felt weak. But Olly gave me strength to keep fighting, he gave me a reason to get better. My last day of chemotherapy was Friday 17 September. A few hours before my husband was due to come and pick me up, he called to tell me that Olly had stopped breathing. I was on the flushing fluids by that point and I begged the nurses to let me go. They ordered a taxi to take me to our local hospital but, when I arrived, Olly had already passed away. He was three months old. I’d battled cancer and lost my baby to cot death all on the same day. A year later I found out I was pregnant again - I couldn't believe it! I'd lost hope that I’d have a child again after everything my body had been through, but Maisy was born in 2012, then Logan in 2014. Today I am healthy, I have two beautiful children, and I’ve moved forwards from the hard times with a positive mind. There were definitely days where I lost myself, but then I would remember that Olly saved my life." Christina Pacitti: "Genetic testing was offered to immediate relatives and myself."